Just thought I'd share our adventurous story from the past weekend...hehe. 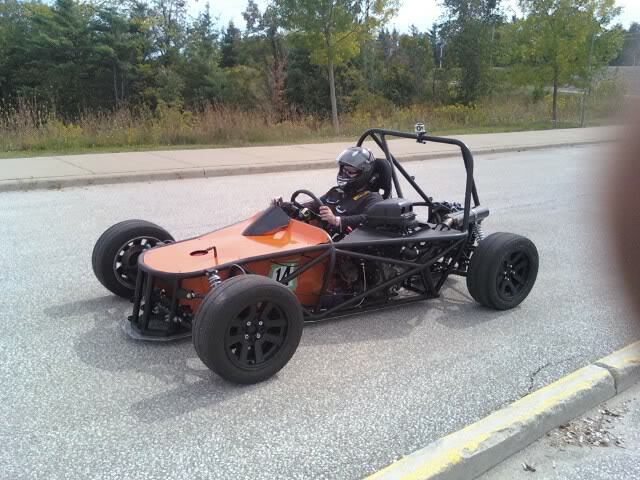 So, this past sunday we had an autocross event up in barrie with our heavily modded, custom turbo 87 toyota MR2. We started the day off as usual. 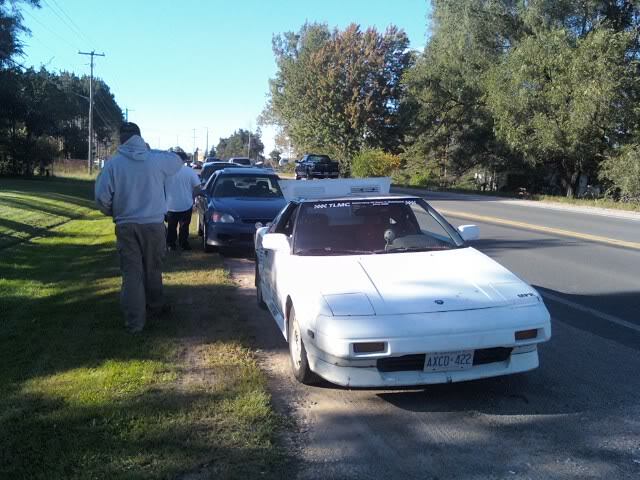 First couple runs, the MR2 was bucking and cutting out slightly. It's done this before, so we checked out the possible problems and attempted to fix them. On one of my runs, it cut out HARD spat fire out the back like a dragon with acid reflux. So I backed off anf pulled it back to the pits. A vacuum line popped off that runs to the megasquirt. Basically the ecu was only seeing atmosphere and wasn't compensating fot the boost that was being jammed in the cylinders... It went WAAAAAAYYYY lean. As true "git-er-dun-ers" we put the vacuum line back on...and this time with a zip-tie. lol. Next run, same thing. She's popping and spitting and cutting out like a bucking bronco... it then dropped down to 3 cylinders and had very little power...UGH! Pulled it back to the pits. Hard to see in the pic, but the ground-strap finger had been smashed into the plug. Something contacted it... Not good. 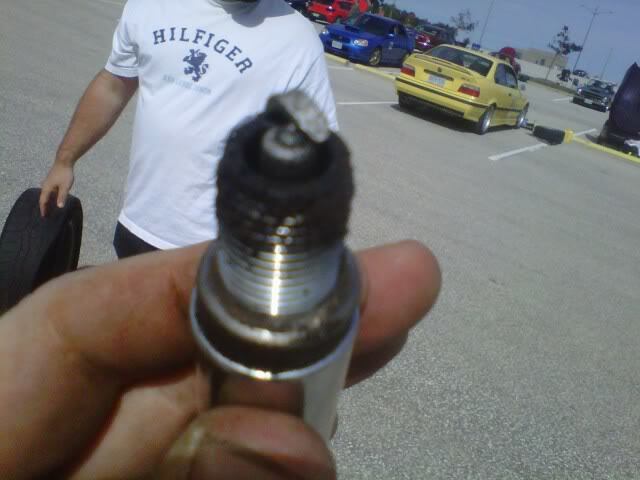 We fixed the plug...sort of, put it back in and it was running on 4 cylinders again. 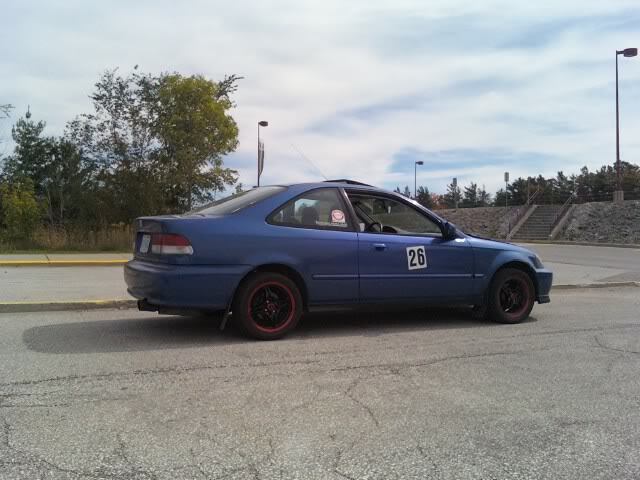 Not wanting to do more damage and not wanting to sit out the rest fo the day... We yanked the toyot RA1 R-compound tires off the MR2 and slapped them on my civic. 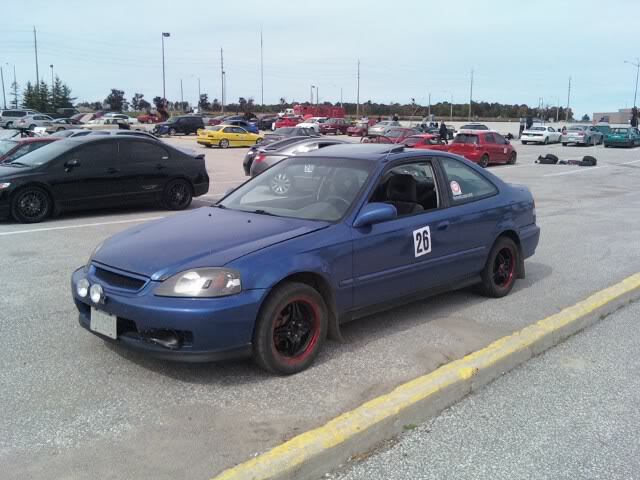 As proof that you DON'T need to slam your can to make it handle well, the ol' EM1 with custom home-brew rally height suspension handled like a champ and put down laps 1-2 seconds faster than any of the cars in both stock classes. Of course we didn't place well competing in the same class we normally run the MR2 in, but we were still happy with it's performance. 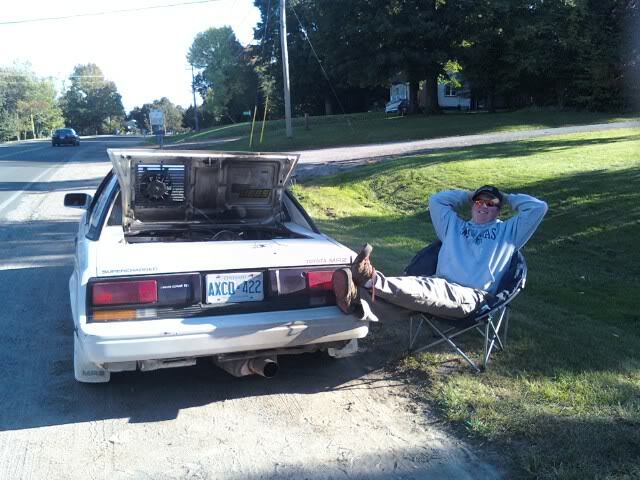 So Tim called CAA and we chilled by the side of the road in style and waited for the flat bed. The truck showed up about 30 mins later and home we went. After getting home, we decided to do a compression test. Cylinder #3, before, was around 110psi (it's an oem low-compression forced induction engine), and it was now down to 80-85psi....Not good. 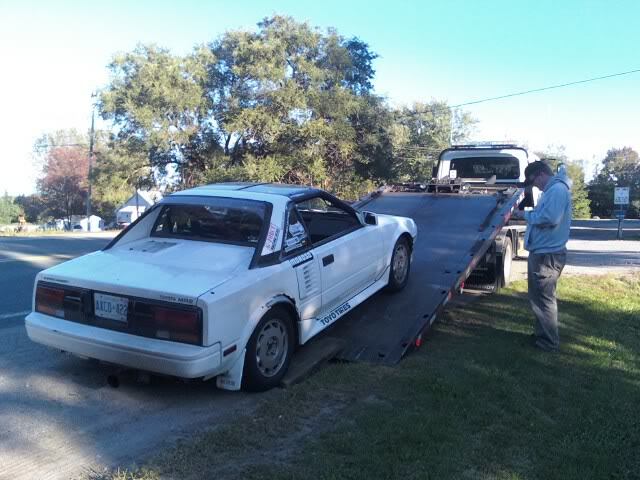 long story short, the MR2 is done for the season. 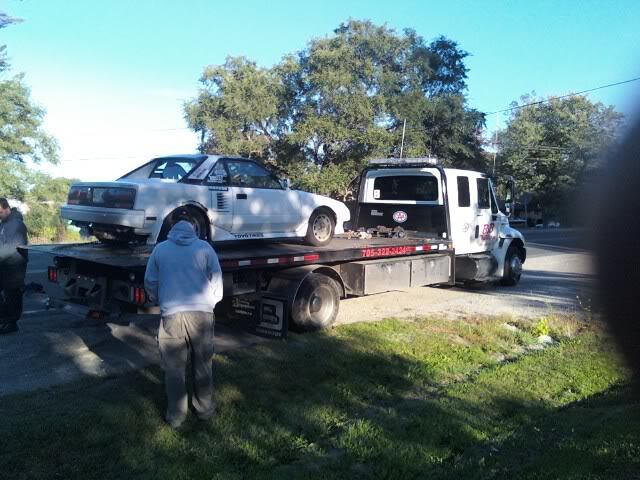 It'll be a long winter project to build a new engine. But it will be stronger and more powerfull next time, I can guarentee that! y is the sir raised? 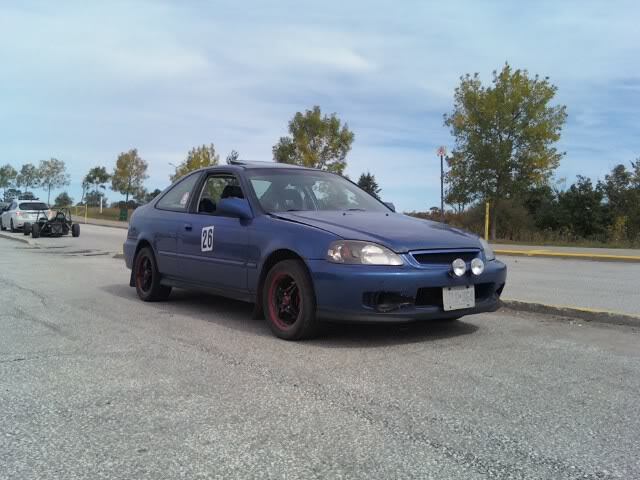 guess you missed the rally car build thread he made a while ago. Good post Mike! Thanks for sharing dude!